If you are trying to eat gluten-free, or just healthier in general, my modern take on traditional Middle Eastern Tabbouleh Salad is a great recipe to try. The bright, fresh herbs, the tender, nutty quinoa, and the tangy, lemony dressing, all make for a perfect flavor combination. One thing that I really enjoy doing is reworking old recipes. This quinoa tabbouleh salad is a perfect example of that. It’s a traditional Middle Eastern dish that I decided to give a healthier twist to. Tabbouleh is a Lebanese dish that is a staple in many Middle Eastern cultures. Traditionally, it is made with bulgur. Bulgur is a cracked wheat grain that has been partially cooked, or parboiled. Bulgur, which should not be confused with cracked wheat, which is a crushed wheat that isn’t parboiled, is common in the Middle East and Mediterranean regions. Bulgur has a light nutty flavor that is commonly used in a variety of dishes and is often used in pilafs, soups, baked goods, stuffing and bread. Bulgur is cooked much like rice. Bulgur is the primary ingredient in tabbouleh, but it isn’t the only one. Tabbouleh also has finely chopped parsley, tomatoes, mint and onion in it. It’s seasoned with lemon juice, olive oil and salt. Different cuisines use different amounts of the same ingredients, leading to different flavors, and often add other ingredients like garlic. Traditionally, it’s served as mezze, or an appetizer like food that is served with alcohol in Middle Eastern cultures. Despite being a staple of Middle Eastern culture, tabbouleh has gained popularity in the US. It’s easy to see why as well. It’s packed with flavor and it’s a perfect dish to showcase all the fresh tomatoes and herbs in your garden in the summer. However, with this one, I decided to switch it up. Instead of using the traditional bulgur, I used a tricolor quinoa that I had on hand. One of the advantages of this, apart from being able to simply use what I had on hand, is that it makes it gluten free. The quinoa has a more delicate texture than the bulgur and is higher in protein as well. Since tabbouleh is a traditionally vegan choice, it’s a great way to increase the protein of your dish. Quinoa is also a great source of fiber, amino acids, magnesium and riboflavin – so it packs a serious nutritional punch! Quinoa is a seed, not a grain, and is very easy to cook up. Much like bulgur, quinoa is cooked like rice. In fact, the easiest way to cook quinoa is using a rice cooker (or electric pressure cooker like an Instant Pot on the rice setting). 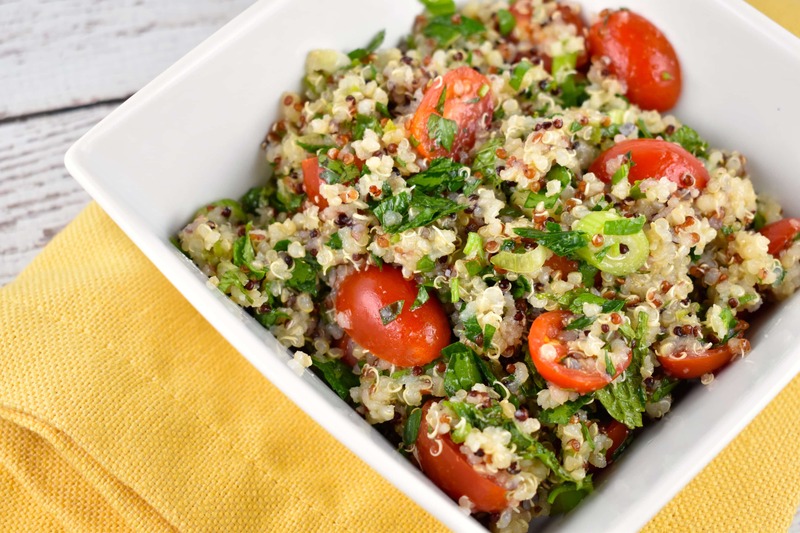 Quinoa works great in a variety of salads and lunches. In fact, I often like to have some of it on hand for quick lunches. It’s something that you can cook up in a batch and keep in the refrigerator for several days. That’s one of the ways this salad is so quick and easy. You can cook the quinoa when you have time one evening, and then whip up a fresh batch of tabbouleh later in the week. I seriously love this salad. It’s light and lemony and is so refreshing. The fresh herbs and tomatoes make it perfect for the summer when your garden or the local farmers market has fresh product. But, I love the flavors of this tabbouleh so much that it finds its way onto my table throughout the whole year! YOU SHOULD ALSO CHECK OUT THESE HEALTHY RECIPES! A bright and healthy Middle Eastern Salad gets a modern, gluten-free twist. Made with fresh herbs and nutty quinoa, this make-ahead salad is a perfect side dish for any meal. Once quinoa has cooled, stir in remaining ingredients. Let chill in the refrigerator for a few hours before serving. I noticed the absence of the print button too. Check out Copy Me That. It will enable you to print any recipe found online in a blog, will also allow you to save & form a recipe box too. I can’t wait to try this recipe. I like your recipes and like to print them out but I can no longer find the print button. Thank you! This recipe looks delish! I will be making it next week!